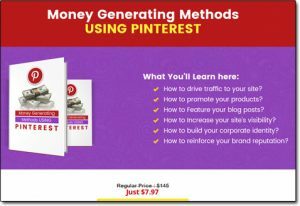 Will Akash Malviya’s Pinterest Money Generating Methods Send Your Profits Skyrocketing? Making money through social media channels is nothing new, and you’ve probably heard about the countless amounts of people who are making full-time incomes from the likes of Facebook & Instagram… Some of whom are even making millions from these platform. However when it comes to making money from social media, or even just talking about social media in general – one platform that rarely gets spoken about is a platform named Pinterest. In fact as you’re reading this review you might have asked yourself “what the heck is Pinterest?” – and that’s because despite it being up there with the “big boys” of social media it’s a platform that quite a lot of people still don’t know too much about. And what might come as an even bigger surprise to you is the fact that according to one beauty retailer named Sephora, Pinterest users are said to spend around 15x more than Facebook users… Ultimately making Pinterest 15x more profitable! That’s because generally the audience on Pinterest is hyper-targeted, meaning that a greater percentage of your following will be interested in buying whatever it is that you have to offer (more on that in a moment). But the question you’re probably left wondering is if Pinterest is so much more profitable, why isn’t anybody talking it? Why is everybody caught up on Facebook/Instagram instead? The answer is simple – firstly it’s because fewer people know about just how lucrative Pinterest actually is, and secondly few of those that do actually know the methods required to make good money. So we pretty much have a platform that has the potential to make people LOT’S of money, with very few people actually taking full advantage of it. Akash Malviya is one of the few people that has reportedly managed to successfully generate a solid from Pinterest (according to himself at least). To increase his income even further he has now decided to launch a product teaching others about the methods that he has used to extract profit from Pinterest. He claims that if you already have an online business his methods will enable you to drive more traffic, thus increasing overall profits. Whilst his Money Generating Methods product does touch on the actual methods of making money themselves (such as affiliate marketing), it’s clear to me that his product is geared towards people who already have a bit of knowledge about online income generation as opposed to complete newbies. I personally think that as a complete newbie this product could be a little overwhelming and in my opinion there are better alternatives available at the moment. But for those who already have experience & are simply looking to grow their business his product could be a good fit, especially since the eBook itself is only priced at $7.97. There are a few additional upsells ranging up to $199 (none of which are mandatory) but I’ll talk more on those in a moment. If you have a blog then his methods will also teach you how you can feature your blog posts on Pinterest to generate traffic directly to those. Whilst Akash Malviya’s eBook contains valuable training, if you really want to generate the kinds of income that you’re promised you will really need the additional help of his tools to help you automate some of the tasks… Otherwise you will find yourself working around the clock like a crazy person. Unfortunately though as you’d probably expect the tools don’t come bundled in with the $7.97 price, they are sold as upsells. I don’t really have an issue with this however I do wish it was made more transparent prior to purchasing the eBook. As far as I can see there is no mention of the additional products/prices on the website itself, you’re literally left to find out about the additional costs after making your first purchase which in my opinion is slightly deceiving. I personally felt like I didn’t get the whole deal. So What Are The Additional Products? The first one is a Pin boosting plugin which is designed to increase the engagement of the posts you publish on Pinterest, and this product alone will set you back an additional $27. Then on top of this you have what Akash calls the “Powerpack of Pinterest”. Again this is another tool to help you automate tasks & increase engagement – this one comes in at a price of $37. Finally you are offered another product named the “Insta Ad Campaign” which costs $199. This is substantially more expensive but this is designed to help you create profitable paid advertising campaigns so theoretically it should pay for itself in the long run. Well it’s safe to that the product is a breath of fresh air in the sense that it’s not a scam. When you purchase this product you will receive an eBook that gives you real actionable training, and training that if implemented does have the potential to make you money. The other good thing about it is the low price tag of the initial offer. I appreciate there are upsells, but I think for $7.97 you are getting fairly good value on the frontend, especially if you are already interested in looking how to expand on Pinterest. If you are specifically looking to grow on Pinterest, then this is a product that can help you – however if you are looking purely to start making money online then I feel there are better products to help you get started. The problem with the Akesh’s Money Generating methods is that it is primarily targeted at Pinterest and it doesn’t really give you a broad overview of the other methods that you can actually use to make money (and there are a LOT). Whilst he does touch slightly on SEO, this is only really about how to get backlinks from Pinterest – meaning if you don’t already have a website (or know about SEO) the information he provides will probably go straight over your head. So to conclude what I’m basically saying is that I feel like Akesh has created some good quality Pinterest training, but unfortunately I don’t feel that his product is a good fit for people simply searching for “Money Generating Methods” as I personally believe there are much better alternatives that give a broader overview of training. Basically if you are really, really interested in growing your traffic from Pinterest & you have $7.97 that you don’t really care about – this product is worth a punt. However, if you’re a newcomer to making money online & you’re just looking to get started unfortunately I don’t recommend this product as a starting point. I’d probably recommend that you try something like this instead which will teach you all the basics first. Anyway, hopefully you appreciated my insight into this system & I also hope that I provided you with everything you needed to know. If of course you still have any comments or questions don’t hesitate to leave them below – as always I’ll do my best to respond as quickly as I can. Insiders Cash Club – Scam or Legit System? My Review Might Be TOO Honest! Is Profit 24/7 a Scam? Read My Review Before Joining This New System!